A comfy pack will certainly make the difference between a hiking experience being enjoyable and its being a nightmare you are not going to want to repeat. When I was a young teenager I started out with an old ex-army framed pack which was hideously uncomfortable as soon as you put any weight in it. (It made me well understand the punishment that is crucifixion). In those days the latter was fairly unavoidable eg even summer-weight sleeping bags then available usually weighed several kilos and pretty much filled up the pack. Adding a tent meant the three items (pack + tent + bag) weighed at least 10 kilos, so even an overnight hike (with a change of clothes was going to push your pack weight well over 20 kilos. Lots of folk were carrying eg 40 kilos for a hike of 4-5 days. Nightmarish. I still see people (eg slight young women) in hiking shops trying on huge ‘bulletproof’ framed packs whose empty weight is 3-4 kilos. This is just madness. You should not expect a pack to last forever. It probably will if it’s that heavy because you will very seldom use it again! DON’T buy a pack which weighs over half a kilo! Be warned! I had Della sew in some light webbing tubes into mine into which I inserted carbon fibre arrow shafts in (@30 grams) to increase load transfer. Now I use a Big Agnes ‘Cyclone’ chairs frame members as load transfer underneath a GG ‘Sitlight’ pad which works well with this pack. I see they now have inflatable ‘Air Beam’ pads (http://gossamergear.com/packs/pack-accessories/gg-airbeam-pack-frame.html ) which MAY do this better but they weigh 60-70 grams & which also provide you with a seat/pillow, but I doubt they are worth it, and they definitely can’t be made into two pairs of emergency shoes! 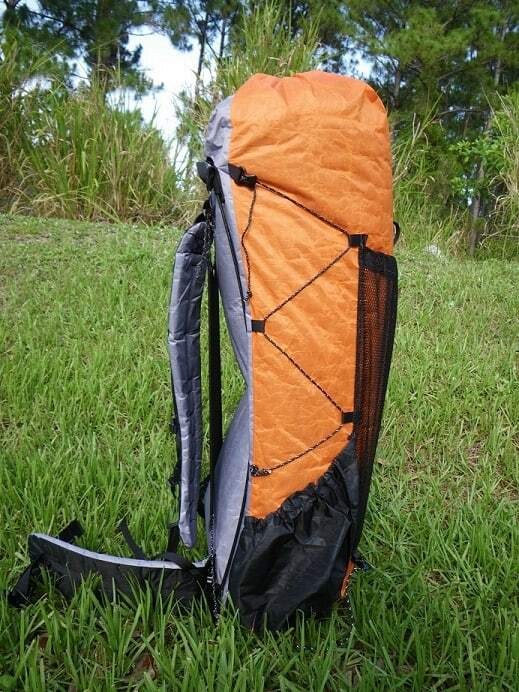 The G4 is a huge pack which easily carries a week’s supplies, an Alpacka canoe etc (approx 2.5 kg) in great comfort. Without the canoe, you should be able to head off with 7-10 days’ food and everything else you need for a week’s , (or even a fortnight’s) hiking in temperatures down to zero C with a pack weight well under 12 kg, and decreasing every day as you eat the food – and drink the rum!) I also have one of Joe Valesko’s (http://www.zpacks.com/backpacks.shtml) ‘Blast’ packs @ 369 grams and a (http://www.sixmoondesigns.com/packs/Swift.html) ‘Swift’ @ 450 grams and another Gossamer Gear offering, the ‘Mariposa’. Mountain Laurel Designs looks as if they might be worth checking out too. All work well and are 500 grams or less. PS: Six Moon Designs seem recently (with their news models) to have ‘lost the plot’. If I was buying a new pack, I would either buy the G4 (cheaper) or zpacks Arc Blast.